at things .... That's Life. See the image below or check out these options for seeing That's Life images. 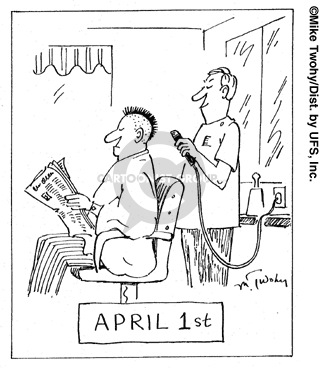 April, April Fools' Day, barber, barber shop, comic strip, cut, cut hair, day, executive, fool, hair, haircut, hairstyle, life, management, manager, mohawk, prank, shop. Search That's Life using keywords and more! Access That's Life by alphabetical subject.